Last week marked one year since I moved to Boston! There were moments when I didn’t think I’d make it, but here I am – mostly unscathed and beyond happy. I love this city so much – I have accumulated many wonderful memories and made the best friends. I have also never cried so much in one year, at least not since I was a foot and a half long and drinking dinner from a bottle. The majority of these tears were a derivative of sadness from those times when I had to leave Karl at the airport. But life is even better now that he has moved here with me! Boston has really shown me a great time. I don’t know how exciting my life would be without SOWA on Sundays, Union Square Donuts, New England apples, and cold winters that could freeze your eyeballs. There are some smells that I strongly associate with certain feelings and moods. The weird smell of my rubber yoga mat, although mostly unpleasant, reflexively puts a smile on my face – I associate that funny smell with all of those amazing yoga sessions that got me through my first couple of months in Boston. Mint is another scent that fills me up with pure joy. When I get even the slightest whiff of mint, I am instantly transported to my childhood bed, slowly coming out of a nice dream on a Saturday morning. On Saturdays, my mom would make a special Vietnamese dish for lunch, and it always featured mint. The mint in our garden was slowly consuming our backyard, so it was no wonder there was mint in everything. 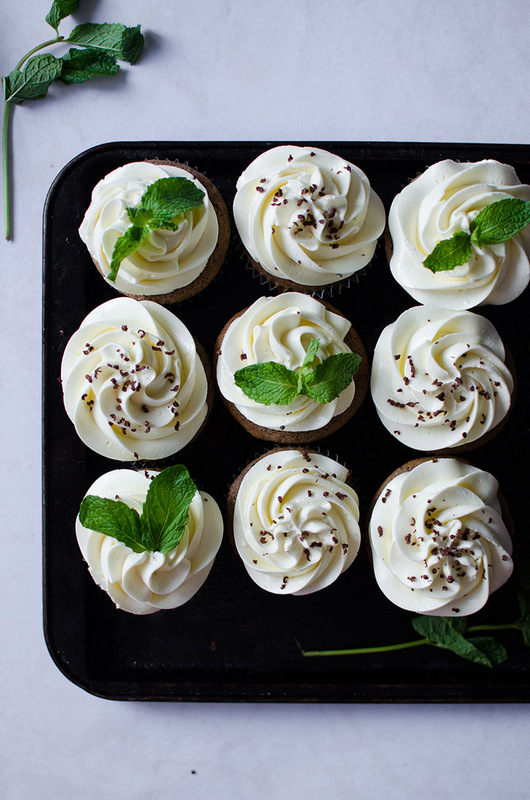 To celebrate one year in my new home and to remind myself of the wonderful times in my old home, I made chocolate sour cream cupcakes with mint swiss buttercream. 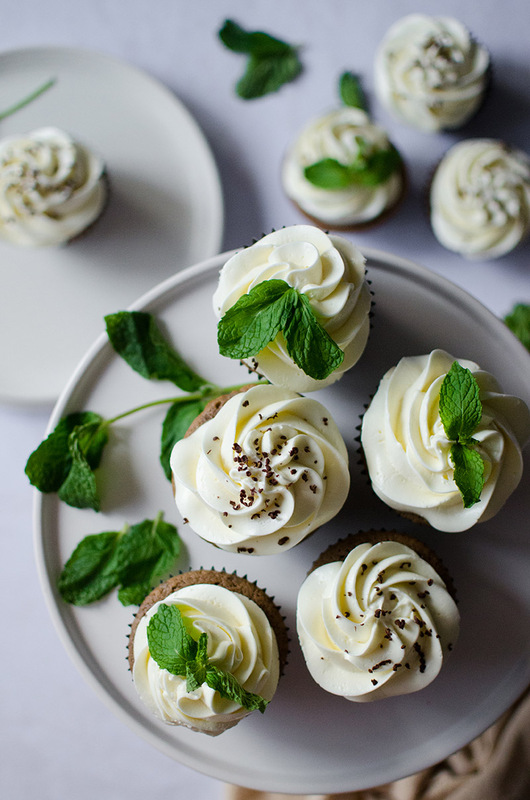 These cupcakes are delicate in texture and flavor. 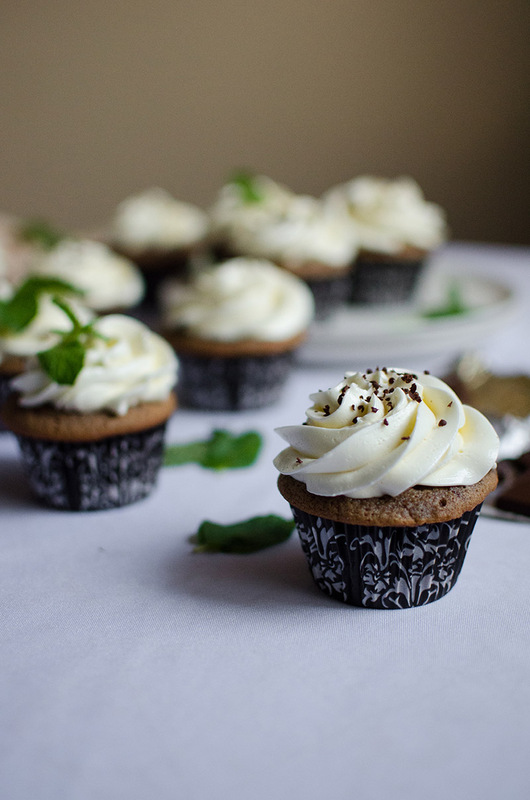 The cupcakes have a very light chocolate flavor, and the recipe is adapted from A Taste of Home’s recipe. 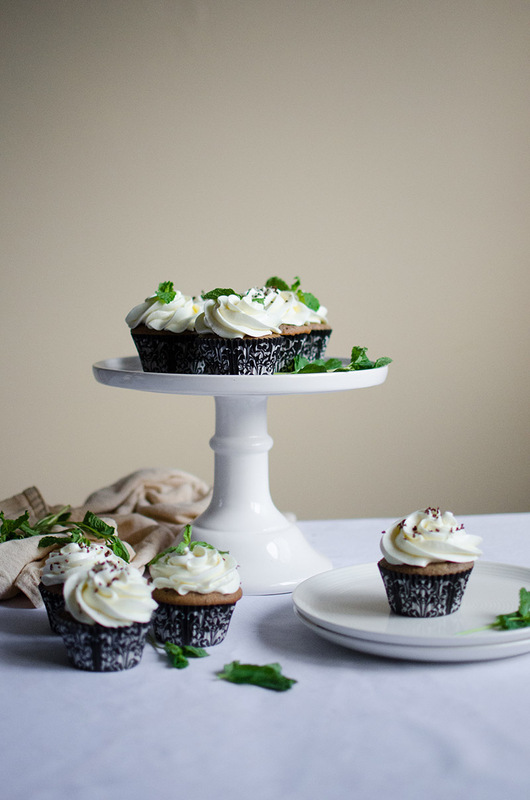 The buttercream was created with help from the Cake Merchant’s Dark Chocolate Matcha Cake recipe, and my recipe has the gentlest hint of mint. Swiss buttercream is a relatively new friend of mine, introduced to me by my friend Arim who is a genius baker. 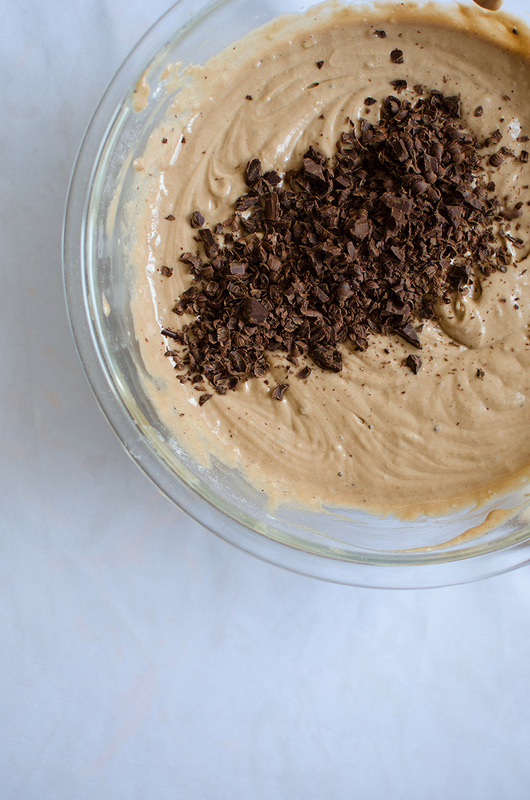 This buttercream is incredibly rich, silky, and smooth. It’s not overly sweet, which I really appreciate, and it’s so much fun to work with. 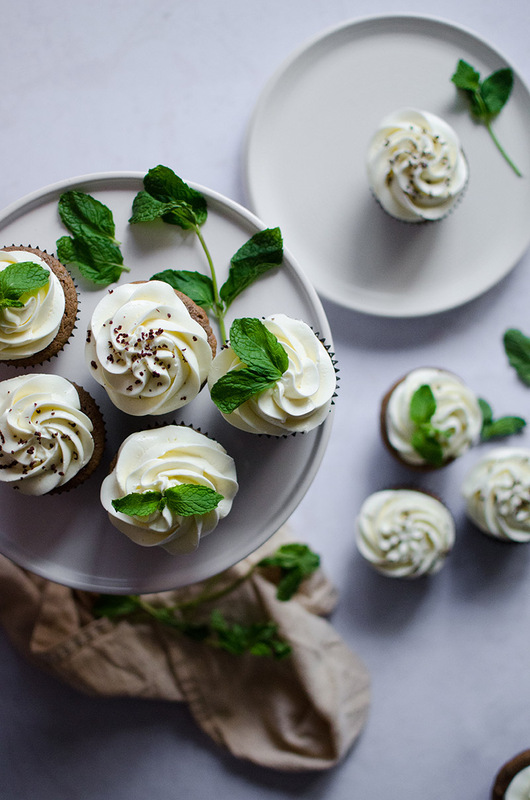 When I take a bite out of these delicate cupcakes, I am only reminded of happy times from the past and the present. 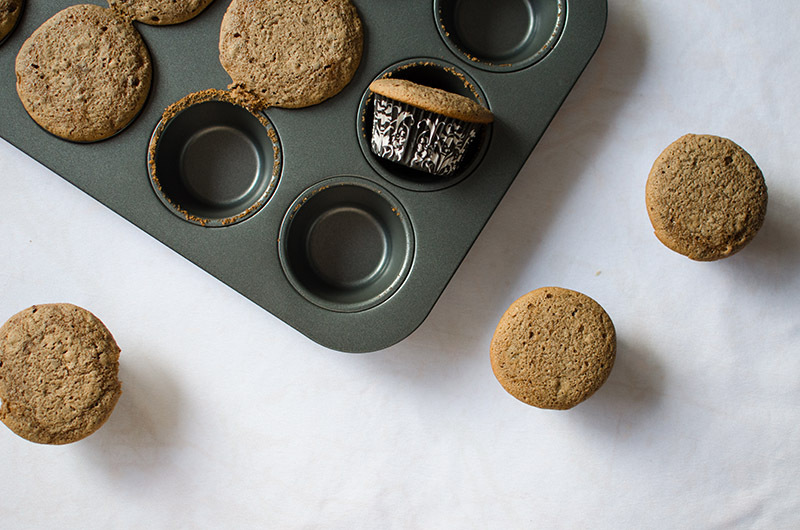 Preheat oven to 350 degrees F. Line 2 cupcake pans with 24 cupcake liners. With an electric mixer, mix the butter, granulated sugar, and brown sugar on medium speech until smooth, about 3 to 4 minutes. Add the vanilla extract and the eggs, one egg at a time. Reduce the speed to medium-low and add the milk and sour cream. Mix until incorporated, about 2 minutes, stopping once or twice to scrape the sides of the bowl with an offset spatula. In a small bowl, whisk together the baking soda, salt, cocoa powder, and flour. Slowly add it to the wet mixture, and continue to mix on medium speed until just incorporated. Stir in the chocolate. 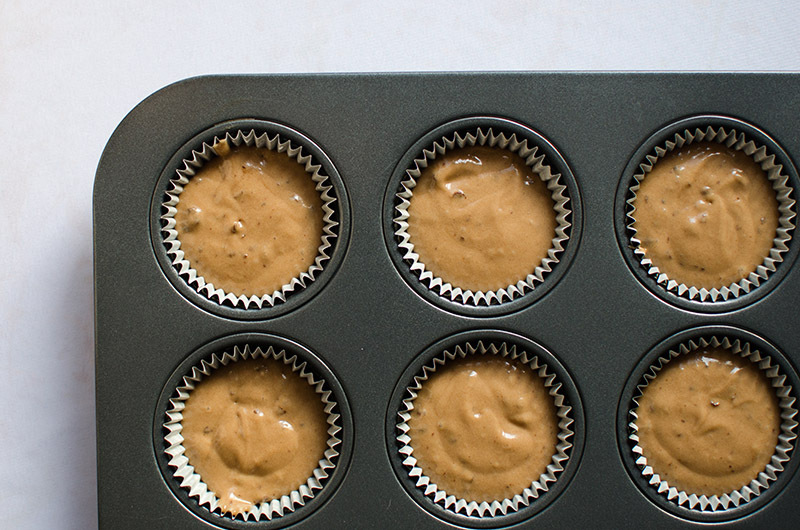 Fill each cupcake tin halfway with the batter. Bake for 19-21 minutes, or until a toothpick or knife inserted in the center comes out clean. Allow the cupcakes to cool in the pan for 20 minutes, then transfer to a wire rack to finish cooling. With an electric hand mixer on medium speed, mix the egg whites, sugar, and mint leaves in a glass or steel bowl over simmering water until the egg white mixture reaches 160 degrees F.
Take the bowl off the heat. Remove and discard the mint leaves. With an electric mixer on medium-high speed, whip the egg whites until they become fluffy and double in volume. Turn off the mixer, and allow the egg mixture to cool to room temperature, about 15-20 minutes. Using an electric mixer again, whip the egg mixture over medium speed and slowly add the cubes of butter, a few at a time. Mix until the buttercream is stiff and very thick, about 8 minutes. If the mixture is too runny and/or won't thicken up, place the bowl in the refrigerator for about 15 minutes, then re-whip until it comes together. Pipe or spread over the cooled cupcakes. 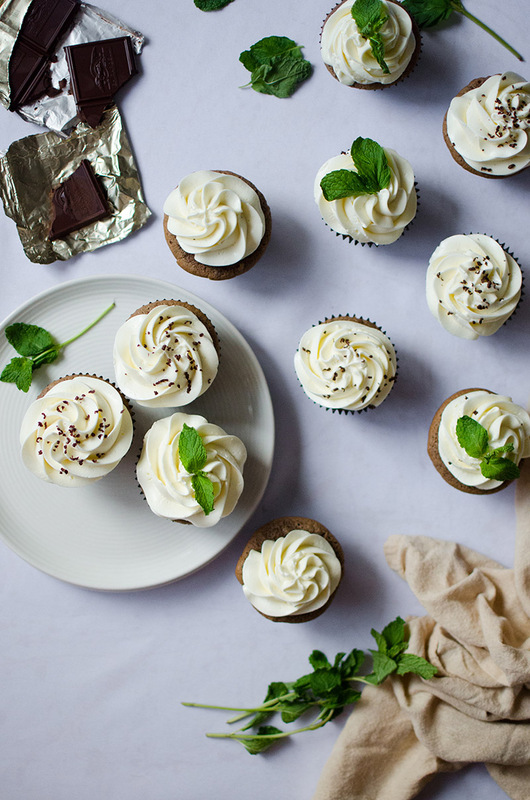 Garnish the cupcakes with extra mint leaves or grated chocolate. 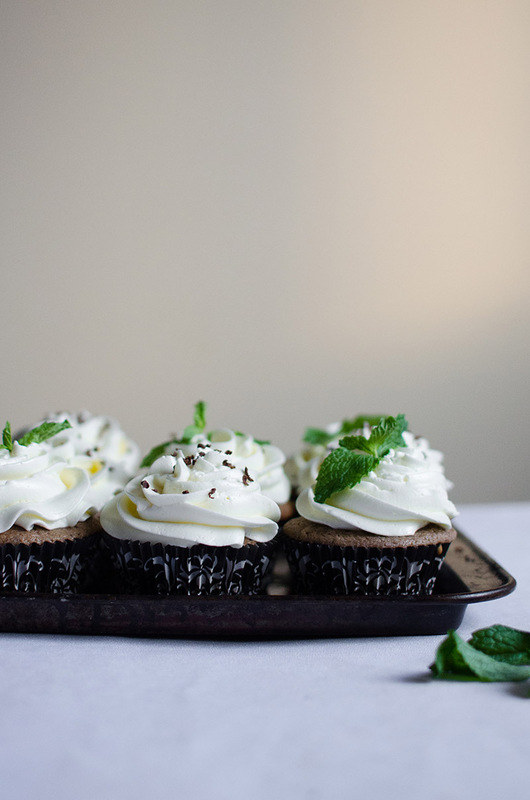 This entry was posted in Desserts & Sweets and tagged chocolate, cupcake & cake, mint, sour cream, swiss buttercream. Hi Connie. I found your muffins on Foodgawker, they look fantastic. And I am so curious about the buttercream, I have never made it with egg whites. As I always have leftover frozen egg whites, this would be a great opportunity to use them. It’s gorgeous, You are an artist! 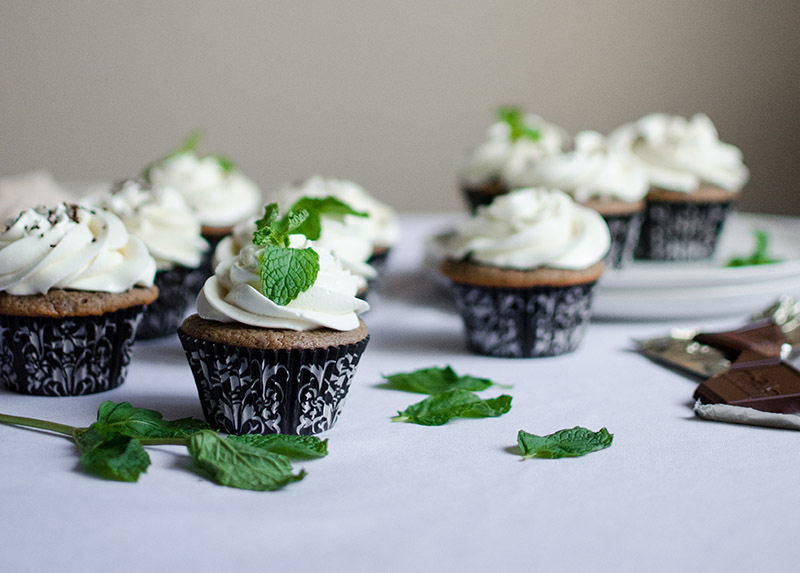 I love mint with chocolate so much, so this recipe is pinned! These look absolutely lovely! I love the combination of flavors. I know the feeling of trying to settle in a new place. It can be so hard, but once you get adjusted its such a relief! These look so delicious, cute and fresh! And the pictures are absolutely gorgeous! Hahahaha, “winters that could freeze your eyeballs”…too true! I’m also a recent convert to Swiss meringue buttercream, and yours looks amazing! Happy 1 year Anniversay, Connie! 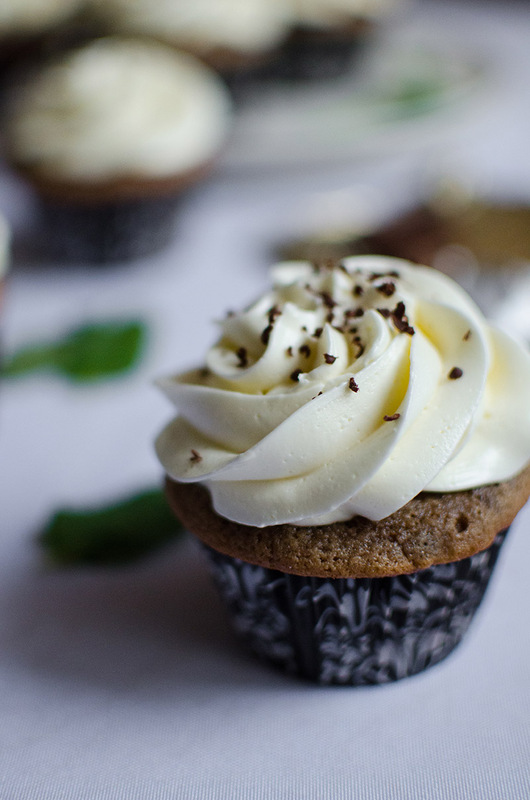 These cupcakes are beautiful and the frosting is luscious and creamy. I love that it is sweet like the standard buttercream. This is truly adorable, Connie!!!! 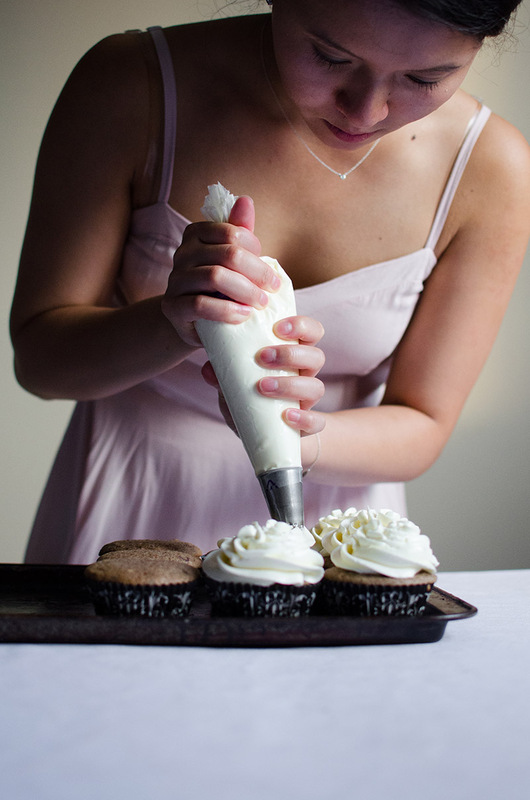 Well done with the frosting…it’s impeccable as is the case with all your recipes. 😀 And what I would give to have someone cook Vietnamese food for me all the time. It would also save me a heck of a lotta money, haha.